One thing I love about the New Year is that you get to go show hunting... the main reason I started this blog. Exciting! Dead Prez comin' to Emo's on March 1st! Along with Umi, Zeale 32, and Just Born! dead prez are a critically acclaimed underground hip hop duo of alternative rappers stic.man and M-1. They have become known largely for their hard-hitting style and politically active lyrics, focusing on racism, critical pedagogy, activism against governmental hypocrisy, and corporate control over the media, especially hip-hop record labels. dead prez made their stance clear on their first album, declaring on the lead song, "I'm a African" that the group is "somewhere between N.W.A. and P.E.". In 1990, M-1 headed to Tallahassee to attend FAMU (Florida Agricultural and Mechanical University) where he and stic.man met and connected due to their mutual love of music and knowledge. "I was soaking up the Black Panther Party as a whole," M-1 remembers. "I learned about their lives and it helped mold me." "I realized there's a struggle already going on and I have to try to help ride it out," interjects stic.man. M-1's quest for insight led him to join the International Democratic People’s Uhuru Movement (InPDUM) in Chicago for three years while stic.man remained behind in Florida and started getting into trouble. Burned out by the arduous labor of Uhuru, M-1 decided it was time to focus on music and stic.man agreed. Dead prez transcribed the political education they acquired into lyrical poetry. Brand Nubian's Lord Jamar discovered them in New York and helped them sign a deal with Loud Records. But being the new kids of the block on a powerhouse label like Loud (home to the Wu-Tang Clan and Mobb Deep) wasn't easy. 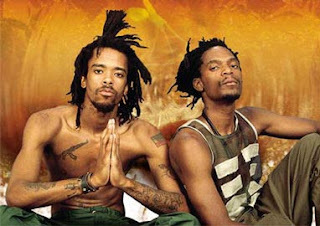 dead prez wasn't always Loud's top priority but that didn't stop them from building a fan base around their over-the-top performances (they've been known to ignite dollar bills and toss apples into the audiences, declaring that they must eat healthily).